Temple Israel Ner Tamid offers exciting and meaningful religious education for children in Kindergarten through Grade 10. The only expense to members of TINT is a small materials fee. Call the Temple’s office at (440) 473-5120 to find out more. 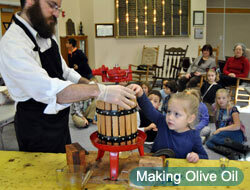 In addition to learning Hebrew and about our Jewish heritage, children have the opportunity to learn by doing. Students have learned about scribes and what they do when creating a Torah scroll (see photo on top of this page). The kids wrote letters or their names on scraps of parchment. Religious school boys and girls also have made olive oil using a hand press during Chanukah and on another weekend created havdalah candles. Our religious school participants also learn outside of the classroom. For example, there are trips to Lake Erie to learn about Jonah and the whale. Older students participate in Chesed Shel Emet, cleaning up a local Jewish cemetery. Classes meed once or twice weekly depending on the student’s age. Grades K – 3 meet Sunday mornings from 9:00 a.m. until 12:00 p.m.
Grades 4 – 7 meet Sunday mornings from 9:00 a.m. until 12:00 p.m. and Wednesdays from 4:00 p.m. until 5:30 p.m. The school calendar is not yet ready. It will be available on-line soon. Bar/Bat Mitzvah preparation can be arranged with Rabbi Matt Eisenberg. 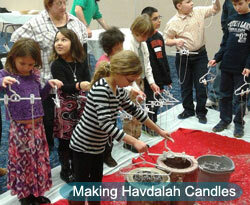 Read the article about our tuition free school at the Cleveland Jewish News.